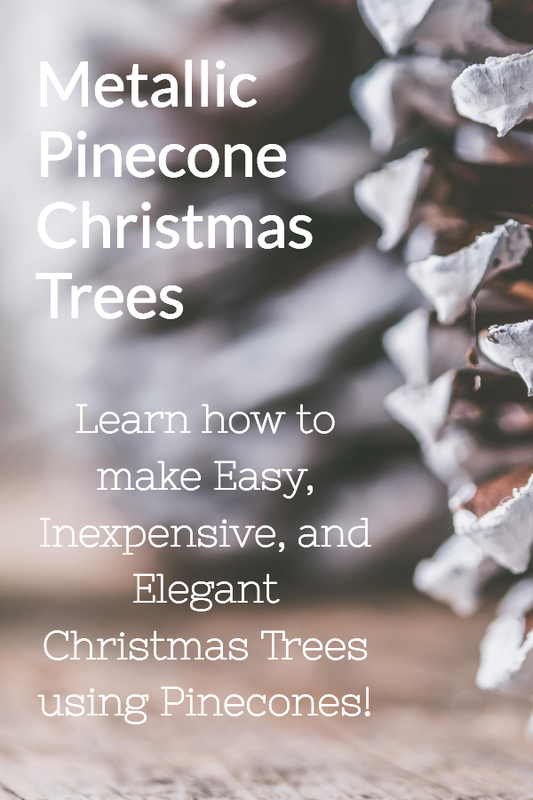 I came across this video while searching for a Christmas craft to do with my tween nieces, and just fell in love with these easy and elegant metallic pinecone Christmas trees! My nieces just loved making these, and decided to make extras to give as gifts to teachers, dance instructors, and other extended family. These look pretty on a mantle, a hall table, or as part of your dining table centerpiece. Best of all, they are not expensive to put together, even though they look stunning once finished. I know you'll enjoy these as much as I do! 1. The first thing you need to do is open up the scales of the pinecones, and this is accomplished by baking the pinecones you will use in a 275 degree oven for an hour and a half. You will need two to three pinecones for each tree made. 2. Once your pinecones are dry, you will spray them completely with your metallic spray paint. NOTE: Please do this step and all spraying outside, in a well ventilated area! 3. Now spray your long stem glass candle holders and your styrofoam cones with your metallic spray as well. 4. Put hot glue around the rim of your sprayed candle holder and attach a styrofoam cone to each candle holder. 5. Now while holding a pinecone, take your scissors and carefully cut out the individual scales of the pinecone. 6. It's time to glue the scales onto the cone. Start a row of scales going around the very bottom of the styrofoam cone, using a small amount of glue on each scale. Continue this row by row, with each row overlapping the previous row. When you reach the top of the cone, you want to angle the scales to form a point at the top. For the final scales, you can flip them upside down which creates a more natural looking point. 7. You will notice that your scales may not be completed covered with the metallic spray. If you like this more rustic look, that's perfect! If you prefer for it to be completely metallic, take it back outside and touch up with additional spray. 8. Now with your glitter glue, let's add some glitter tips to the very end of your scales for a little bling and polish! This project is so easy and the end result is so beautiful. No one will believe you made these yourself! If you're looking for an inexpensive yet elegant piece of holiday decor, try this project today.